Weber is a company that’s prides itself on perfecting existing designs, as well creating new ones, so it was no surprise when they decided the Q240 grill needed improvement. The Q240 was an earlier model electric grill, which lacked functionality, and was not particularly great to look at. This decision led to the birth of the Weber Q2400, released in 2014, and I thought it was time to check if these changes had any effect at all in terms of performance. This Weber 55020001 Review will inform buyers of the new features, thus serving to advise them on whether or not a purchase is warranted. 20 minute warm up, as oppose to the more familiar process on non-electric grills, of lighting charcoal. The 280 square inch cooking area will be an issue for large gatherings, but is more than enough to feed the family and some friends. 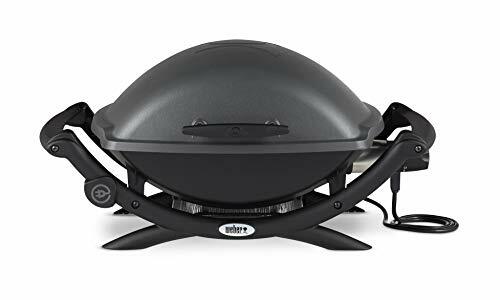 The Weber 55020001 Q 2400 Electric Grill has measurements of 25.1 inches length, by 31.5 inches of wdith and is 26 inches in height. It’s only 40.4 pounds in weight which makes the Q2400 very light and portable, and it can also be bought as a space-saving option. The Design of the Weber Q2400 is much the same as on the Q240, except this new model is smaller; Both where made of high grade aluminium so are durable, and easy to clean. The assembly is not an issue because the Q2400 arrives fully assembled. Once taken out of the box, buyers will see that they have a grill with 280 square inches of cooking surface, which is mid-range for the market. In my experience anything over 250 square inches is enough to feed a family and some friends, but for larger gatherings, a grill with a surface of over 300 square inches would be required. I didn’t have a problem feeding my three children a some family friends in the Weber Q2400 and at 1560 Watts it’s one of the more powerful Electric grills on the market. As far as taste and flavour go, the performance here is the same as the Q240, in that it is near perfect quality, as Weber have again used Cast Iron grates, which help cook food evenly and don’t break down the moisture barrier in meats. What you get is moist, flavorsome steaks and ribs cooked quickly. While the results aren’t in question, and the Q2400 will be very appealing to owners of electric grills, as an upgrade on their existing model, buyers used to firing up charcoal might find grilling a strange experience with this ritual being absent. The Q2400 contains some interesting and very positive changes from the Q240, which was already a great grill. The handles on the Q240, that always seemed to get too hot, have larger grips, to cool them down, and make them easier to hold. There are also larger controls and ergonomic handles on the side. Ergonomic handles are particularly important for those who grill regularly, as they are much more comfortable and help to reduce stress on the wrists. This new model is also much lighter than the Q240, and so has greater portability which will be a relief for many buyers. Another great feature for buyers is that the catch pan is now easier to remove, so cleaning is a lot easier; This is an excellent common sense move on the part of Weber. Having used charcoal grills more than Electric grills, I found the 20 minute warm up, slightly surreal, but easy to get used to, since cooking amazing food is the reason I grill, and this Weber Q2400 definitely does that. I can’t argue with the price; at between $250 and $300 owners of Electric Grills will see this model as a definite improvement in terms of design and taste, from their current grills; while owners of charcoal grills may wish to switch over. The grates are superb, and the functionality is vastly improved with larger controls and handles. The Verdict: Well worth the money, a recommended purchase.